Research in the Ciborowski lab deals with the distribution, behaviour, and ecology of aquatic invertebrates as influenced by natural and human-induced environmental stressors. We study lake, wetland, and stream habitats in the Great Lakes basin (especially western Lake Erie), and the Athabasca Oil Sands region of northeast Alberta. 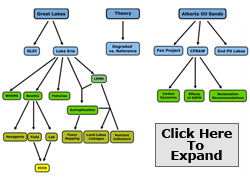 For a flow chart of the major Ciborowski Lab projects and areas of research, please click on the Project Map thumbnail below. The Project Map also contains links to the external websites of collaborative projects of which the Ciborowski lab is a part. 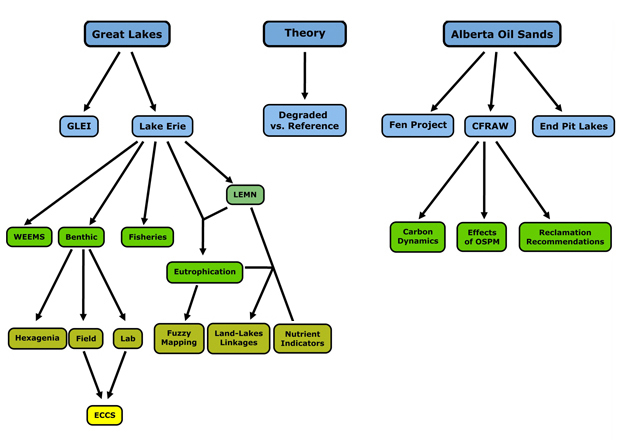 Figure: A flow chart of the areas of research and projects worked on by the Ciborowski Lab. Click on the individual boxes to read more about specific projects.